But Michael wasn't content. Because while so many connected insiders were getting rich, Michael knew that the average investor was getting shut out. What's more, the inventions we'll take for granted tomorrow are hitting the market today. Things like printed living organs… a universal vaccine that treats a hundred different viruses… memory cubes that let us connect 100 billion devices across the globe… “living” metals that cure cancer, Alzheimer's and addictions. And that's barely a taste of what's about to come. That's why Michael Robinson created Radical Technology Profits to bring these billion-dollar opportunities to folks who see the vision but aren't sure how to start cashing in on it. 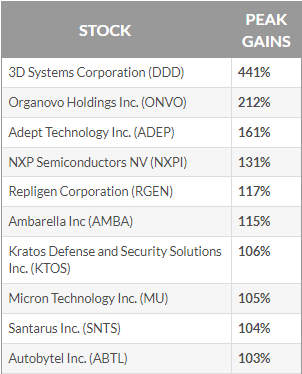 Michael's other inaugural recommendation, 3D Systems, climbed 30% in just four months. Michael (and his readers!) have never looked back. But Michael had been holding private meetings with CEO Eric DeMarco, so he knew something most investors didn't. He knew that the Pentagon would never cancel its contracts with Kratos. This was because, thanks to fees written into those contracts, cancellation would actually cost the government more than fulfillment. Like the time he told his readers to get in on LIN TV, a full-fledged media company that built its business on local TV. You see, because Michael worked in newsrooms for more than 20 years, he could see that LIN TV was masterfully combining its local TV's sales edge with the boom in new-media technology. For one, as a veteran reporter, he has a Pulitzer-quality nose for spotting a breaking technology story. And of course there's that million-dollar Rolodex. While other analysts are glued to their screens, hoping to spot a trend, Michael might be out sailing with Reed Tausig, CEO of a promising software startup… or dining with Dr. Joseph Kim, CEO of a biopharmaceutical firm that's leading the drive into synthetic DNA vaccines. But at the end of the day, the real secret to all of Michael's double- and triple-baggers is something he calls his Real Demand Tracking System. On average, you'll receive four new investment briefings every month through Radical Technology Profits. And Michael is there with you every step of the way to help you manage these plays. Rest assured, if Michael sees something important happen at the opening bell, he'll send you an alert about it before the closing bell. Now along with the four monthly investment research briefings, you'll also receive instant sell alerts. So when it's time to exit any opportunity and collect maximum profits, he'll send you an additional alert via email. You'll also get weekly briefings that explore the economy, the markets, the groundbreaking technologies that are being developed, and, of course, all current investment opportunities. In addition, Michael records audio and video reports of his meetings with the CEOs and innovators at the companies he's targeting. Plus, you'll have 24/7 access to the Radical Technology Profits website where every communication is archived, and you can constantly monitor a real-time review of all of our open positions. Because Radical Technology stocks operate in volatile corners of the market (that's why they can shoot up so quickly), Michael protects you against losses and market mood swings by employing trailing stops, usually 20-25%.